Allergy season has hit like a tsunami. I feel like cats crawled up each nostril. Graham Hancock: all politicians should drink ayahuasca 10 times. Mexico prepares for the Maya 2012 Apocalypse by accepting all credit cards. From guacamole to chocolate, how Maya foods shape our waistlines. 15 foods that can improve dream recall, intensity, & lucid dreaming. Terrific new website resource for everything lucid dreaming. Exploring the Edge Realms of Consciousness (Amazon US/Kindle & UK). Green Stars of the Forest: bioluminescent fungi of Mt Kinabalu. Icaros, medicine songs of the Amazon (Amazon US/Kindle & UK/Kindle). Do trees communicate? Networking, from fungi & roots to the highest leaf. Music of the Spheres: listen to the Earth’s dawn chorus. Astrophotographer films awesome video of Jupiter’s rotation. Enjoy the view on an alien world of a crescent moon. Comet could become as bright or brighter than the full moon in 2013. Sir Richard Branson wants to colonise Mars within his lifetime. Retired Air Force Colonel accuses US Govt of UFO cover-up. Searching for extraterrestrial life is a priority for China. Battleship: US & China join naval forces off California against alien threat. Spawn of Cthulhu: secrets of the squid from Hell revealed. I’ve heard many people say that it’s time for the government to appoint an agency to investigate [UFOs]. Folks, there *is* an agency, a very close-held, compartmentalized agency that’s been investigating this for years, and there’s a very active role played by many of our intelligence agencies that probably don’t even know the details of what happens once they collect the data and forward it. It’s kind of scary, isn’t it? ~ Charles Halt, Col. USAF Ret. A gang of ragweed and goldenrod stopped me on the street today, asked for money and when I said I had none, they left me bloodied behind a Rite Aid dumpster….. Some of us chemtrail watchers think it possible that this ragweed story is intended to mask widespread allergic reactions to intense chemtrail sessions in the skies. Yesterday we compared notes on the Warrior Matrix site and realized that nearly the whole USA was being sprayed all day long. Here is what I am talking about. Admissions to hospital emergency rooms with allergic respiratory symptoms always accelerate when chemtrails are being sprayed. 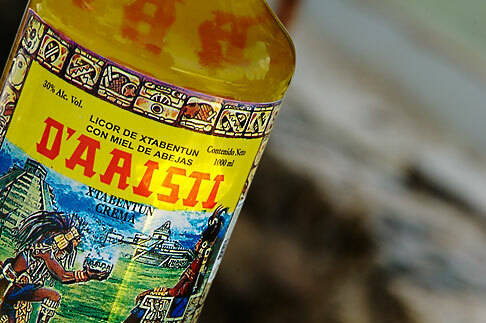 No decent Yucatecan meal would ever be complete without a bottle of Xtabentún: an anise & honey liqueur.